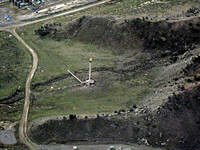 Flaring is a technique used by the oil and gas industry to burn off unused natural gas. Most oil wells produce natural gas (mostly methane), which bubbles up alongside the more valuable oil. 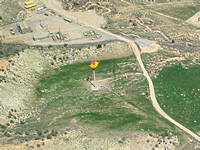 In many cases, the gas is treated as waste and burned off rather than captured and sent to market. If companies don’t have technology and infrastructure in place, it’s cheaper to burn the gas than to process and transport it. While it’s better than simply venting the gas into the air, flaring releases huge amounts of greenhouse gasses and as many as 250 hazardous air pollutants, including carcinogens such as naphthalene and benzene. It was estimated that over 134 billion cubic meters of natural gas was flared in 2010 globally, producing over 400 billion tons of carbon dioxide without producing any energy or heat. 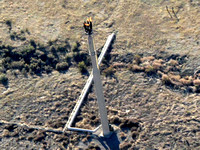 Emissions from flaring are dangerous for those living nearby, and a growing number of residents close to oil and gas operations in Colorado and the country are getting sick, worried that their health is being sacrificed for energy extraction. Groups in Colorado are proposing regulations that would require companies to reduce their VOC (volatile organic compounds) emissions. They argue that it’s a win win situation for both sides; drilling companies would be able to capture and sell the resource that is now being wasted, while at the same time protect residents’ health. Some countries in the Middle East have drastically reduced flaring practices, and are aiming for a zero-tolerance policy on flaring in the next few years. Here, it’s all a matter of regulation, politics and economics.